The Villa Borghese is a large natural park in Rome. It contains a few buildings, attractions and hosts the Galleria Borghese museum. It's main entrance is through the upward leading path of the Spanish Steps. The area was a vineyard up until the In the 17th century. Then Scipione Borghese, Cardinal and nephew of the Pope Paul the fifth, turned the area into a splendid garden. The vineyards of the Villa Borghese were quite famously renowned. Then, in the 19th century, the garden was given an English refinement twist. At the begining of the 20th century, the park stopped being privately held and became a public place for locals and tourists alike. The original villa was built by Flaminio Ponzio, Cardinal Borghese's architect. 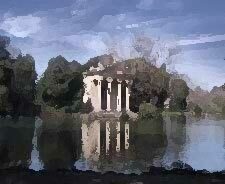 that was named Villa Borghese Pinciana. It is now housing the largest museum of the park, the Galleria Borghese. - Museo Etrusco (Etruscan Museum), housed in the former 16th century built Villa Giulia. - Sculptures from famous artists like Bernini, Caravaggio and Antonio Canova can be found on a raised plateau next to the villa. 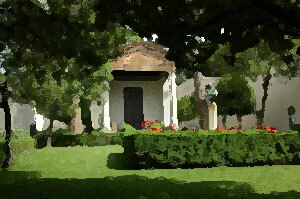 It is in fact a distinct garden called Casino Borghese that displays these artefacts. This was setup by Camillo Borghese and also displays paintings by Raphael and Titian. - Villa Medici contains the French Academy of Rome. - Many other smaller villas that can be found in the park are reminders of the 1911 World Exposition that was held in Rome.